Removing rusted, corroded or locked steering bolts is often a lengthy, difficult and frustrating task, especially if using a ratchet wrench. It usually requires the application of penetrating fluid or blasting the area with a torch – this is time consuming, can cause unwanted damage and it’s a potential risk to your safety. 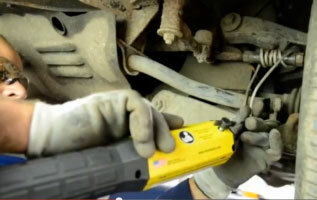 The Mini-Ductor handheld induction heating tool heats metal parts in seconds. This allows all types of adhesives bonded to metal, fasteners bonded with thread lock compound, and seized hardware, to be removed and released much quicker and safer than by traditional naked flame heating. Using a torch leads to heat being blown away from the load, wasting its energy and transferring its heat to unwanted areas. With the Mini-Ductor nearly all the energy pulled is applied to the load, using INVISIBLE HEAT®, making the tool faster and more energy efficient. 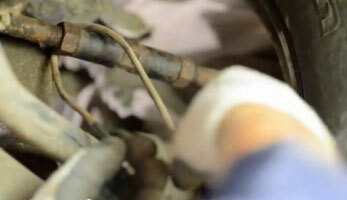 Mechanics do not need to run the risk of using a torch which could damage the CV joint, rubber grommets, or the rotor. The Mini-Ductor coils come in different diameters to suit different nut sizes and the Bearing Buddy flexible, heat resistant coil is ideal for this application (see images below). Induction heating provides a safer, quicker and less damaging alternative to naked flame heating and a great return on investment. 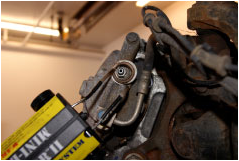 Apart from the increased safety benefits, the use of the Mini-Ductor can increase a garage’s fastener extraction productivity by over 50%. Step 1: Clean area with wire brush. Remove dirt and grease. 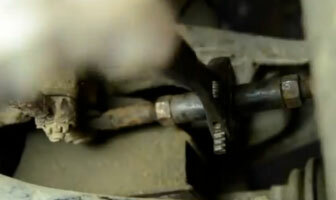 Step 2: Wrap the steering bolt with the Bearing Buddy Coil. Step 3: Attach the Mini-Ductor. Step 4: Heat the Bearing Buddy Coil. Step 5: Remove the Bearing Buddy Coil. Step 6: Select tool for loosening the steering bolt. Step 7: The steering bolt is loosened easily.